It was only for a half a mile or so... just had to drive slowly. Road to Gray's Arch Trailhead. Off the trail, we could see this odd looking tree stump. Very strange because there was no other fungi like this anywhere else. Only this one tree stump. Yes, we bought some "don't shoot me" shirts! Our first view of the arch. It's huge! 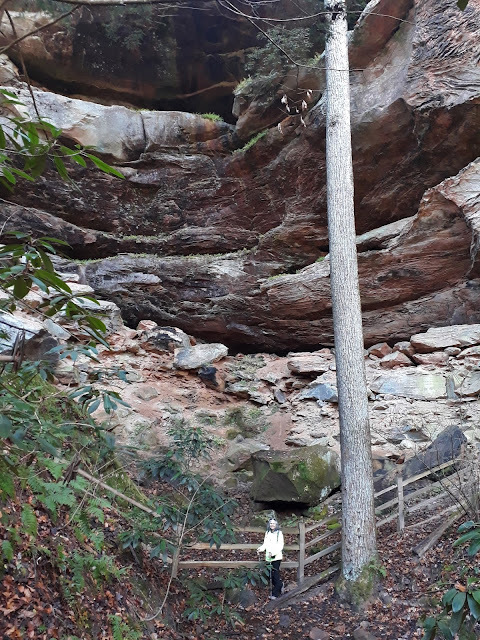 The trail goes under some big rock shelves. So weird how the roots grew down these rocks. It looks like a steel pipe... but it's just a piece of rock. Very strange. Really good trail, with lots of interesting things to see. We took the circular route that was almost 5 kms (3 miles). It was lunch time by the time we made it back to Sherman, so we had something to eat and then it was almost 1:30pm by the time we hit the road. We didn't have far to go, but part of the drive was on a very twisty back road. Our destination was the huge Visone RV Wrecking Yard. We were hoping they might have another 1996 Damon Daybreak or similar other year that might have some parts that are in better shape than some of Sherman's parts! Unfortunately you're not allowed to walk through the rows of RVs. We wandered around their indoor parts display. Lots of junk... but if you need a certain rare part, they did appear to have it cataloged. One thing we've been looking for for quite a while is a wheel cover the same as Sherman's other three. The missing one fell off on a highway just outside of Bangor, Maine about five or six years ago! Haven't been able to find a matching one since. And we were not in luck this time either. They did not have a 1996 Damon Daybreak on their 140 acres of row upon row of junked RVs. And we were looking for a used windshield for Ruth's side. It has a big crack across the center. A new one is about $630 USD plus installation. I could probably do the install myself. But they didn't have one. We can't yet justify $630 for a new one, so we'll just leave it for now. By the time we finished at the junk yard, it was just after 4:00pm. We though about asking if we could just park at the wrecking yard, but the small city of London, Kentucky was only 20 minutes south. So we drove to the Walmart to get a couple of things. The Walmart and surrounding area was a zoo of traffic. Yuck. No idea how such a small city could have so much traffic. We picked up a couple of things and got the heck out of there. But the sun was starting to go down. I had picked out another forest campsite, but it was another half hour drive and we hate arriving after dark. I had seen the sign for the airport and knew that it wasn't far. We got there, and there were maybe four or five cars outside the small terminal building. And a small empty parking area that would be perfect for Sherman. Sherman, parked up at the London-Corbin Airport. I went into the terminal, and found a friendly guy behind the desk. I explained that we were just passing through, and would it be okay to park for the night. "Sure, you go right ahead" the guy says. We've stayed the night parked in quite a few small airport parking lots. No idea why this hasn't caught on with other RV'ers. Oh, and we have fast, free wifi! What a great spot! Yesterday's drive, 80 miles (128 kms). Today, we're headed back in to the southern part of Daniel Boone National Forest to a state park that is located in the forest. We'll pay a little more for one night of camping, but there is a reason we're going here. It has something to do with the full moon tonight! Find out in tomorrow's blog post! Top quality Klymit Sleeping Pad... 40% off today only! 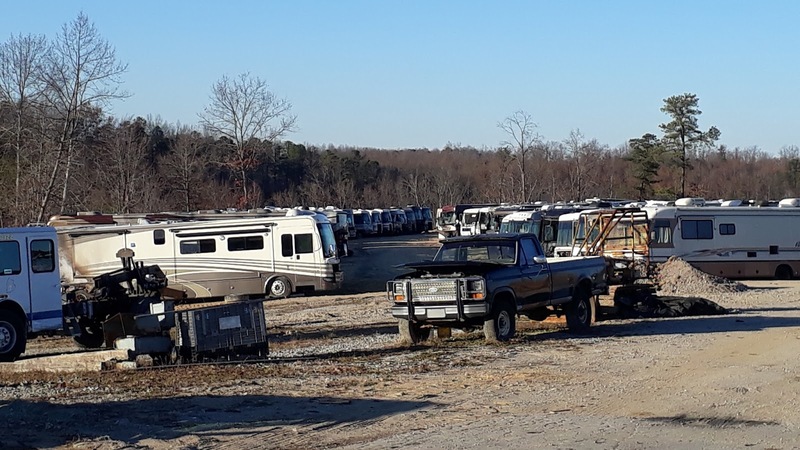 Love checking out the rv junk yards Colaw Rv salvage yard is amazing, for used rv parts. Too bad we're not headed into Missouri, but we'll keep it in mind for next time we're through that way thanks George. Interesting trail hike. Enjoy your travels! Yep, it was interesting with all the different rock formations. I've had very little luck finding parts for my 92 Georgie Boy, always wondered what I'd do about a broken windshield. I did get a beautiful set of wheel covers (19.5") for just over $200 off the internet, though. 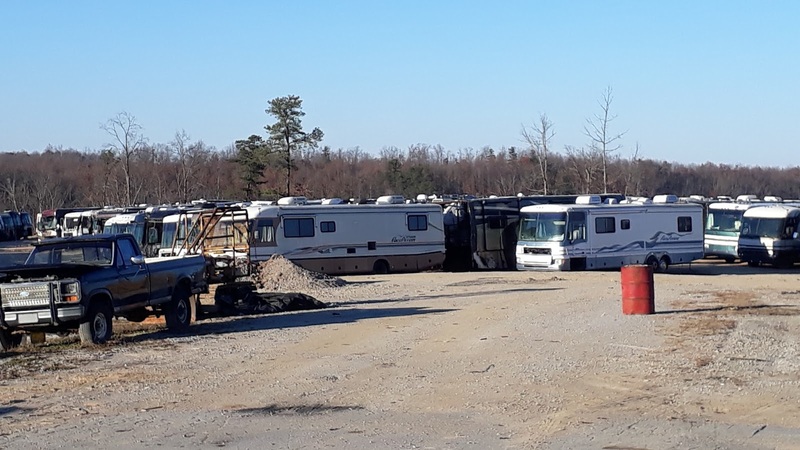 There is another real big RV salvage yard in Missouri that we would like to check out but it won't be on this visit, perhaps our next one. We will continue to keep our eyes open though. That area looks so prehistoric with the gigantic trees and rock formations. Definitely prehistoric looking! I love all the moss that covers the fallen trees and rocks. 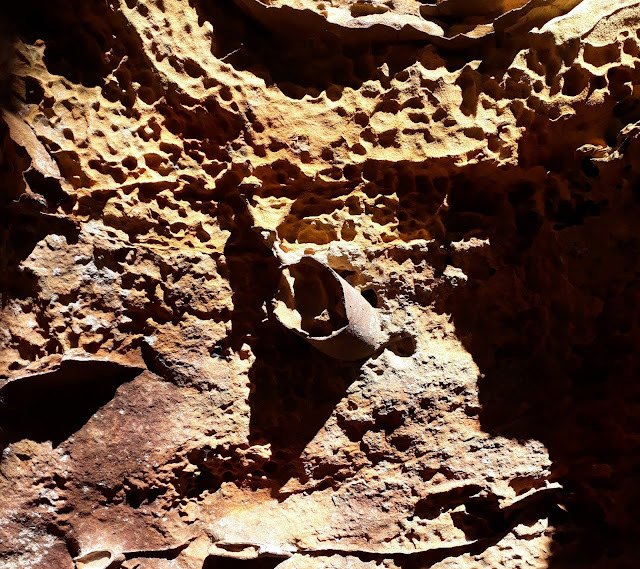 What a fun hike, love all the rock formations. We have a 2000 Damen Escaper that on our last trip somehow got a cracked windshield. Our insurance covered it minus the deductible, found the windshield and had it shipped to a local glass shop. Were very pleased with their service. We never paid extra for the windshield damage on our insurance, in Saskatchewan it is quite a bit more because of all the gravel roads that they have up there. We will continue to keep our eyes open for a used one or a new one providing that the price is right or until this one gets bad enough that we HAVE to change it. Yes, there is no doubt that it could be used as a movie set. The lot is HUGE, I think the guy said that it was over 140 acres, with over a thousand of old/new(ruined) units on it. Are you sure you and Ruth don't share some DNA with Daniel Boone from Kentucky? You two gravitate toward his namesake forests like a magnet. In the late 1990s, I worked with a corporate attorney named Daniel Boone Reese, IV from Johnson City, TN who was a descendant of old Daniel and kept a small statue of Daniel on his desk given to him by his Grandfather. He said it was easy to be related to Daniel as he had many, many children. Hope you found a great camping spot in the park. Who knows maybe we do! ;-) We just love to hike. I bet tonight’s stop has something to do with water!!! Love the new bright colours! Amazing hike, pics were fantastic. Too bad about the junkyard inventory in terms of Sherman's needs, but an interesting looking place for sure. Keep on having fun. Nope, they had nothing for Sherman. Hopefully we can find what we are looking for somewhere else. Nothing is in immediate need at the moment, it is just things that we would like to change around on him. Looks like a fun hike. It would be fun to visit the parts yard. We used to do that all the time when we had our aging 1978 VW van. Many different and interesting things on this hike - what fun to go hiking with you!